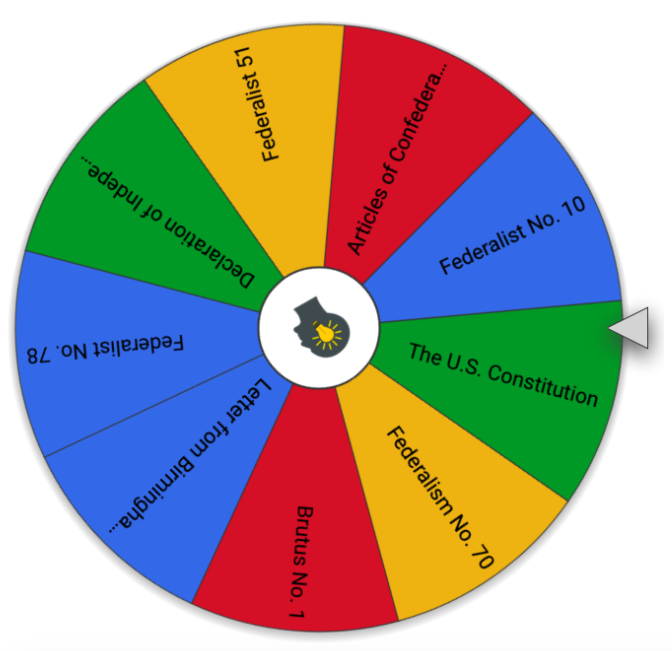 Our Wheel of SCOTUS contains all 9 Foundational Documents form the AP GoPo redesign. You can play any way you like. Here are my rules. Divide the class into 3 teams. Teams 1, 2, and 3. Project the Wheel of Foundational Documents so all the students can see. The teacher spins the Wheel of Foundational Documents . Everyone must be silent. Anyone speaking out of turn is penalized one point for their entire team. When the Wheel lands on a case, the first person to raise their hand gets to try first. Only that person may speak! This lucky person has five seconds to state correctly what the foundational document is about. If the person answers correctly their team gains one point. If the document is correctly answered, remove it from the wheel with the REMOVE button from the online game board below. If the document is not correctly answered, keep the case in the game with the CLOSE button from the online game board below. All students should take notes on correct answers in their Wheel of Foundational Documents Review Sheet. At the end of class all students should have their review sheets completed. Repeat until there are no documents left on the wheel. The team with the most points wins. You could (if you believe in this sort of thing) award extra credit points base don the final score. Our Wheel of SCOTUS contains all 15 landmark Supreme Court Cases form the AP GoPo redesign. 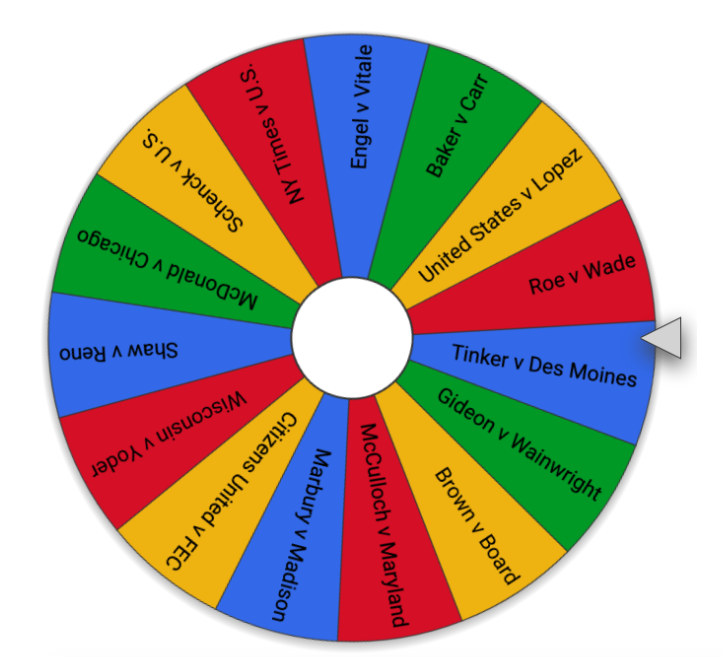 Project the Wheel of SCOTUS so all the students can see. The teacher spins the Wheel of SCOTUS. This lucky person has five seconds to state the main Constitutional significance of the case correctly. If the case is correctly answered, remove it from the wheel with the REMOVE button from the online game board below. If the case is not correctly answered, keep the case in the game with the CLOSE button from the online game board below. All students should take notes on correct answers in their Wheel of SCOTUS Review Sheet. Repeat until there are no cases left on the wheel. The team with the most points wins. Password 2.0 GoPo VoCo Review Game! We've remixed our favorite review game! Use the vocabulary terms from the original Password game (above) or the list of 10 Password 2.0 terms (below). Each team picks a team name based on what they think is the most important GoPo topic to study for the exam. For example, Team Federalism, Team Presidential Powers, or Team Civil Liberties. Each team sends a guesser to the front of the room. The guesser must turn their back towards the screen/board so that they cannot see the term! Project a vocab term from your password game onto the screen or write a vocabulary term from the list below onto the board. For example, write/project Establishment Clause onto the board. Each team has 30 seconds to think of one word clue (that is NOT the actual vocab word or any variation of the term) to help the guesser say the vocab term. For example, the team CANNOT give its clue as: Establishing Phrase, or Rhymes with Establishment Paws. Teams should be very quiet as they generate their clue so the guessers and the other team can’t hear them. The team, which the teacher judges to have named itself after the most important GoPo topic goes first. That team says their clue word, which the teacher writes on the board. For example: Church. That team’s guesser has 30 seconds to guess the vocab word. For example, they might guess, Theocracy. If they correctly guess the word, they win one point, if they don’t guess the word then the other team has thirty seconds to think (quietly) of one clue word to say to help their guesser guess the same term that is on the board. After they give their clue, their guesser has 30 seconds to guess the term. For example, the second team might give their, State. If their guesser correctly guesses the term that team wins a point, if they don’t guess the term correctly, for example, the guesser from the second team guesses, Freedom, then we move on to the next round. The game continues, alternating between teams until one guesser correctly guesses the term. For example, in the second round, team one might give their clue: Amendment, then if guesser incorrectly guesses, Jefferson, then the other team gets another shot to give another clue, for example: Wall, for their guesser. Play continues until eventually a guesser says: Establishment Clause. You could set an 8 clue limit to speed play. Award one point to the team that guesses the term and then move on to another round with a new term. The team that correctly guessed the term in the last round, always goes first in the next round. Thanks for playing Triple O with us. Let's find the odd one out. We'll give you a group of four GoPo terms. You figure out which one does NOT belong. Very good, the answer is d - the Ministry of Magic is not one of the three branches of the US government, yet!!!!! Expecto Patronum! That’s right. c - the anteater doesn’t belong. According to Article I, Section 4 of the U.S. Constitution Anteaters cannot be impeached. You'll get one point for the correct answer (objective) and one point for the most creative and ingenious answer (subjective). The teacher will give one point for each objectively correct answer, and, if you convince them of the merit of your (incorrect) answer, you'll receive bonus points for ingenuity and original thinking. Add up your points and crown a Triple O Champion! Now let’s move on to the first and only round! 1. Which one doesn’t belong? 2. Which one doesn’t belong? 3. Which one doesn’t belong? a) New York Times v. U.S.
4. Which one doesn’t belong? 5. Which one doesn’t belong? 6. Which one doesn’t belong? Now I’ll leave you with this and I won’t tell you the answer. See if you can figure it out. 7. Which one doesn’t belong? Now it’s your turn to be creative/silly. In a team, make a list of four GoPo terms, three of which go together, one of which doesn’t. Share your list with another team and see if they can find the right answers. Then compile all the best team groupings and enter them into the form below! We’ll share the ones that aren’t totally embarrassing on the world-wide internet. You'll find all the answers to the game in the download below. It's time to play BinGoPo! Learn! Review! Enjoy! Win! Make Bingo Great Again! Students may not use books or notes to play BinGoPo unless they really, really, really need to. The day before you play BinGoPo bring a bag of dried beans (canned beans are tasty but messy) to class or have each student bring 15 dry beans or coins to class. Each student will use these materials to make 15 bingo markers. In a pinch you can shred up little pieces of paper for BinGoPo markers or declare yourself Czar for life and take a nap. You also need to make a sign that reads, “Electoral College Dropout!” that any student who calls, “BinGoPo!” incorrectly must wear all day!!!! Unless you are anti-American you know how to play Bingo: B29, G9, N22, etc. Well today we are going to play bingo for GoPo: BinGoPo! Instead of calling out stupid letters and numbers (where’s the challenge in that!?! ), we will be calling out GoPo definitions, and students will be finding the term that matches that definition on their BinGoPo card! The first person to get four terms in a row is the winner! Teachers will have a definition of each of the BinGoPo terms (see following pages). They will also have a list of distractor terms, terms that are NOT on the BinGoPo cards but sound like they might be-we don’t want to make this too easy! Without saying the term, teachers will read one definition to class at a time. When students believe they know which term matches the definition, they should place their marker- bean/coin/paper - on top of the term on their BinGoPo card. The first person to correctly get four markers in a row on their BinGoPo card should yell out “BinGoPo!” Have the students read off their answers to verify that they are the winner. If a student says “BinnGoPo!” and they are incorrect have them hold an “Electoral College Drop Out!” sign all day!!!! The winner gets 270 electoral votes and _________________. For homework, students make their own BinGoPo cards and 15 terms and definitions that they believe will be on the exam. Also have them make 6 distractor terms that are not on the cards! Use our attached BinGoPo cards as a model for the students. Students trade their cards with a classmate and check to verify that the terms are important and that the definitions are correct. Students turn in their cards to the teacher/regent. The teacher then chooses the best card and definition set and copies these cards for the entire class to play another round of BinGoPo. Print out all the terms and definitions. Cut the pages so that each term is separate from the definitions. Scramble the definitions and terms. Give each student any 3 terms and any 3 different definitions. Make sure all the terms and all the definitions are distributed to students. Students race through the room to gather all the definitions of each of their terms. The first person to get all their definitions is the winner and wins ____________. You can get all the rules & Bingo Cards in a handy printable download by clicking on the button below!